On 2 November 2017 we hosted our 7th Export Action Plan Competition final at the Embassy of Switzerland and once again it was a fascinating day of pitches by 9 inspiring SME exporters. Pitching for the £3000 cash sponsored by Bibby Financial Services and further e-commerce and market research support from Thrive Digital and the British Library Business and IP Centre, the 9 shortlisted companies gave presentations showing how they’d use the cash to implement their plans for international growth. The judging panel consisted of Paul Fraser, (Regional Head of Corporate – South, Bibby Financial Services), Emil Stickland (CEO, Thrive Digital), Marieke Hood (Head, Swiss Business Hub UK & Ireland), Sean Ramsden (CEO, Ramsden International), and Michael Rukstuhl (Director International Tax, PwC Switzerland). They had been invited to the final having submitted their completed Export Action Plans using our online planning tool. While we have previously run competitions for the food, drink, creative and tech sectors, the only theme or condition for entry into this year’s competition was that each finalist had factored into their plans a strategy for the potential outcomes of the UK’s exit from the EU. The finalists came from a wide range of sectors with beetroot ketchups, English cream teas, acupuncture needles and training, luxury childrenswear, and learning apps for children with special educational needs all on show. The final took place at the Embassy of Switzerland in London and kicked off with aesthetic acupuncture training and product house Acuregen discussing the challenges of having to adjust their strategies to different markets and therefore differing business cultures, with the USA and the Middle East both in their sights. They were then followed by our first ever returning finalists at an Export Action Plan competition – and the first of three returners on the day – in The Foraging Fox. The beetroot ketchup producers have kept busy since their last appearance but are looking to consolidate in Europe ahead of the potential impact of Brexit in 2019. Green Sheep Group then sketched out their global vision, including working with Mothercare in much of Asia and beyond, before Hounds of Eden pitched their quirky but high quality Harris Tweed pet products. And as if you couldn’t have a more diverse start to proceedings, the fifth company were Lifestyle Services Corporation Ltd who pitched their training methodologies for the global obesity epidemic, discussing a technique that looked at the mental as well as the physical root/effect of the problem. The second half of the showcase saw another two returning finalists take to the stage. Mymanu once again wowed the audience with the Babelfish style translating ear buds they had shown us at the Tech meets Creative showcase in March. Since the spring Mymanu have gone onto be named one of the world’s top three innovators by Marriott hotels, who they now have a commercial relationship with in Spain. They were followed by Special iApps C.I.C., returners from our very first final in January 2016. Special iApps have done great work to systematise their export approach in the last two years, and their learning apps for children with special educational needs are now being used all over the world. The final two companies both showed how Britishness can help brands to attract international customers from all over. The English Cream Tea Company showed that the appetite for scones, jams, teas and creams is a global one, not just a British one. Jane Malyon, the Chief Scone Gnome, noted that Brexit actually offers British businesses the opportunity to indulge in the idiosyncratic nature of Britishness and use it as a marketing tactic to attract new global customers. They were followed by The Great British Baby Company who showcased their luxury childrenswear that again drew on ‘Brand Britain’ for its international appeal. With the biggest markets for their products being in Japan and China, the impact of Brexit shouldn’t be too great either, with import duties likely to remain about the same as they are now. Each of the 9 presentations had given the judges plenty to think about and as ever they were left to make a nigh-on impossible decision of who should win. In the evening there was then a panel discussion on ‘Best practice in export – Swiss and UK Approaches’, hosted by the Embassy of Switzerland in partnership with the Institute of Export & International Trade. The panel discussion was chaired by Lesley Batchelor – our CEO and the Director General of the Institute – with HE Ambassador Alexandre Fasel giving the opening remarks. The panel saw three high performing British SMEs (Ramsden International, Brompton Bicycles, Bremont Watch Company) and three Swiss counterparts (Regloplas AG, Arktis Radiation Detectors, Panolin Holding AG) exchange experiences and advice around selling internationally. You can read more about the panel discussion here. The panel discussion concluded with Lesley announcing The Great British Baby Company as the 7th winners of the Export Action Plan Competition, with The Foraging Fox and Special iApps C.I.C. as runners up. 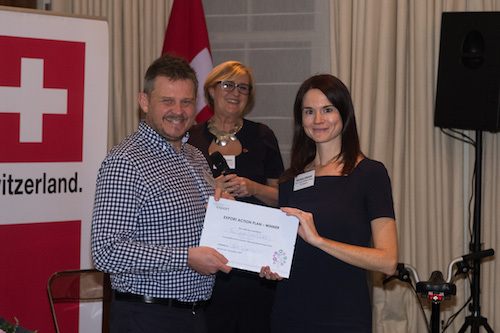 Rachael Attwood (Managing Director, The Great British Baby Company) was rewarded with her winners’ certificate by the 4th winner, Rik Gardner from Rik Chop Brewing Arm. Congratulations to The Great British Company who are our seventh winners and a massive thank you to Bibby Financial Services for sponsoring the cash prize. 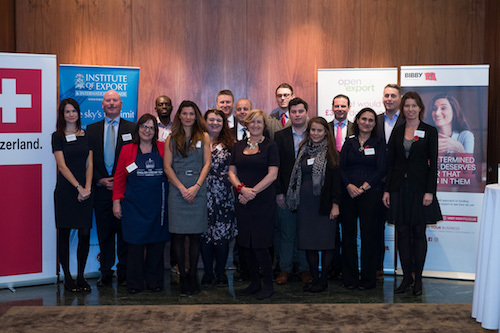 We’d also like to thank Swiss Business Hub UK & Ireland for hosting us, and to Thrive Digital, the British Library Business & IP Centre, and the Institute of Export & International Trade for contributing further prizes and supporting the event. You can view photos from the final here.